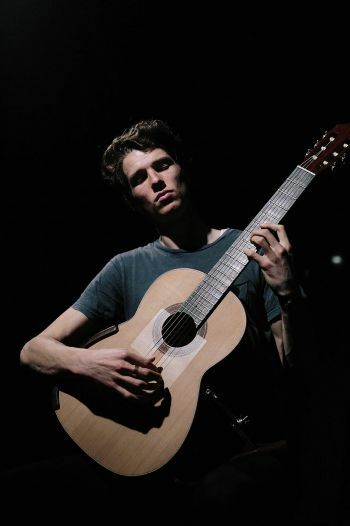 Classical guitarist Callum Henshaw is considered one of Australia's leading young players. But it was injury – not youth – that opened his heart to becoming a more connected performer. Henshaw spoke to Off The Leash about his journey so far. Can you introduce us to the style of guitar you play? I play classical guitar – that’s a style of acoustic guitar that’s strung with nylon strings and uses the fingers of the right hand to pluck. The music? Think Bach, Scarlatti, Tárrega, but also music by alive and kicking Australians. You started playing guitar as a very little guy, at the age of six. How did you end up picking up guitar? It’s funny because I don’t even remember picking it! My parents say I just kept asking for one to play until they finally gave in. Music is important to my family, especially my mother, but I’m the sole musician. It hasn’t always been smooth sailing, though – I really only truly decided to make music my profession in my first year of university. Playing guitar isn’t usually considered risky business, but you’ve suffered injury in your career, haven’t you? Usually the biggest risk a guitarist faces is breaking a nail. Alas, I was a little less fortunate. A combination of heavy touring, heavy bags and a foolhardy attitude resulted in some damage to my nervous system. What did you have to do to rehabilitate? How has that changed your guitar playing experience? I’ve slowly developed my understanding of this with the stunning help of a physical and psychological therapist. The ordeal has made me more physically aware, but also more emotionally open, both of which deeply affect my performance. What do you love most about playing guitar? I like the two polar extremes – the precision, refinement and control of the recording studio, and the unpredictability, joy and comradery of performing on stage with other musicians.